The metal plant labels are perfect for potted plants,vegetables,herbs,flowers,nursery stock,greenhouse and etc. They will make your plants different and more beautiful.They are great garden markers or nursery tags. The self-adhesive polyester labels are waterproof and corrosion resistance.You must use an oil-based pen to write,not use a water-based pen. You must clean the surface of metal plant markers before you paste. 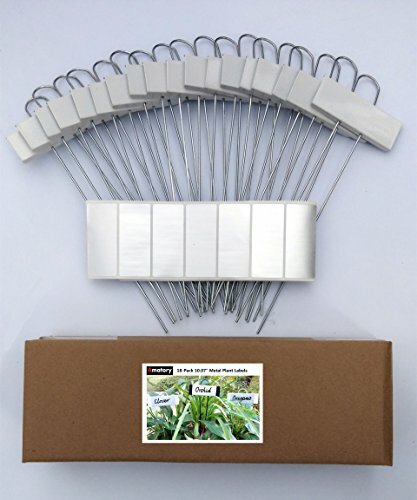 Package Includes - 18 reusable metal plant labels,36 self-adhesive polyester.They are great garden markers or nursery tags,perfect for potted plants,vegetables,herbs,flowers and etc.They will make your plants different and more beautiful. No Rust and No Fading - The nameplate of the metal garden markers is made of painted steel.The bracket is made of plated steel.The metal plant markers won't rust and the color will never change or fade. Can Be Reused Many Times - First,write the words on the self-adhesive polyester labels.Then paste them on the metal plant labels.The self-adhesive polyester labels can be easily replaced or torn off.So,the metal plant labels can be reused many times. Waterproof Corrosion Resistance - The self-adhesive polyester labels are waterproof and corrosion resistance.You must use an oil-based pen to write,not use a water-based pen.You must clean the surface of the metal garden labels before you paste them. Money Back Guarantee - 30-day Money Back Guarantee! 100% Replacement for defective items! If you are not satisfied, please send a mail to the seller. View More In Plant Labels. If you have any questions about this product by Amatory, contact us by completing and submitting the form below. If you are looking for a specif part number, please include it with your message.